This is part two of a three-part series on what i find to be best practices for flushing, harvesting and curing. I notice that plants are more full of themselves when the moon goes full. If someone kept track of the weight of wood, in terms of yield, they found that as compared to trees that were taken around the new moon, trees that were harvested on a full moon yielded 40 percent more. I should be able to footnote this, but I believe it and it is my experience. My sense of it, for cannabis, is that as an annual plant it is very responsive to the moon. Cannabis is a very light sensitive plant, and a full moon at times is a little bit like daytime. I believe that the best time to harvest plants is near the full moon, just before sunrise. Another component of harvest time decision making is how ready is the plant for her harvest. As the trichomes fill in on the flowers they start off almost clear in color. Then as they mature they turn milky colored and then to amber color. Most folk who work to produce trimmed flowers like to wait until most all trichomes are milky and some portion of them have gone on to amber. 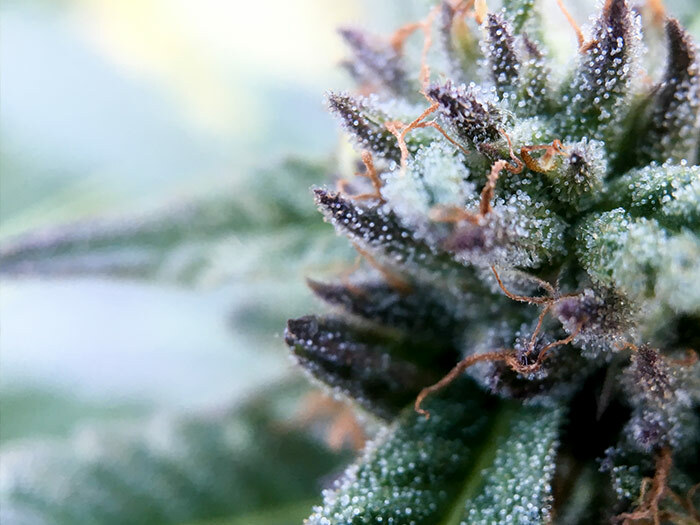 If you are seeking to maximize the difference between CBD and THC take them when there are not yet any amber trichomes and a good portion are still clear. This reduces the amount of THC that the plant will have, as CBD forms before THC in the biosynthetic process of cannabinoid production. The previous day we like to remove all the brown and yellow leaves from the plant in preparation for harvest, and take down the support structures so they are out of the way. Right at harvest try to take the whole plant at once so that all the material from that plant is the same. Depending on the size of the plant it may be necessary to take her apart in the garden. We break the plant down into branches and hang the branches in the drying room.